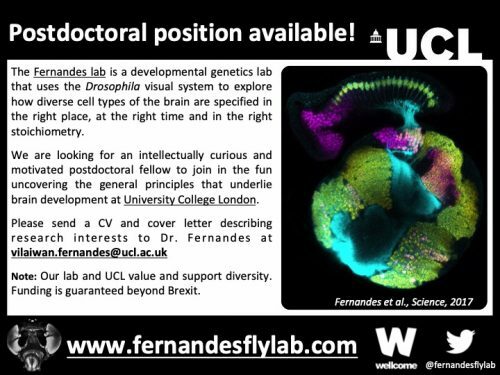 We are looking for an intellectually curious and motivated postdoctoral fellow to join in the fun exploring how glia regulate neurogenesis and neuronal fate-specification. Our approaches are interdisciplinary and involve genetics, live imaging, computational modelling, single cell RNA sequencing, etc. Available projects include: (1) Understanding how signals from glia impart unique neuronal identities (a follow up to Fernandes et al., Science, 2017). (2) Characterising glial diversity in the visual system. (3) Exploring glial involvement in neuroepithelial proliferation. Formal applications will be accepted online through UCL’s job portal till May 3rd, 2019. If you cannot meet this deadline but would like to apply, please contact Dr. Fernandes as soon as possible. Note: Our lab and UCL value and support diversity. Funding is guaranteed beyond Brexit.